Of all the many, many original features lining Netflix’s slate for 2017 – think War Machine or David Ayer’s fantastical Bright – there’s a vocal pocket of subscribers keeping a close eye on Okja, the all-star monster movie in the works from South Korean filmmaker Bong Joon-ho. Best known for helming Memories of Murder, The Host – another monster movie cut from a similar cloth as Okja – and 2013 cult hit Snowpiercer, Joon-ho has assembled quite the ensemble cast to bring his latest feature to life, and today we have three new images designed to shed light on the human side of Netflix’s upcoming creature feature. Given that Okja largely centers on the unusual bond between the titular animal and a young girl named Mija (Ahn Seo-hyun), it’s only fitting that the young up-and-comer is ushered into the spotlight here. Throughout the course of Joon-ho’s monster flick, our pint-sized lead will be risking life and limb to shield Okja from a prying corporation, and it’s this human/other relationship that lends the movie its heart. 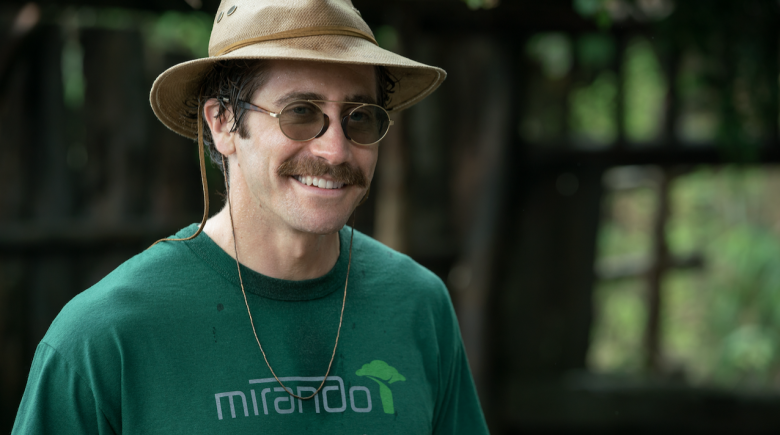 There’s also a sneak peek at Tilda Swinton and Life star Jake Gyllenhaal in character, with the latter rocking a glorious mustache. As if that wasn’t exciting in and of itself, Okja also features an international ensemble comprised of Paul Dano, Better Call Saul star Giancarlo Esposito, Steven Yeun, Lily Collins, Devon Bostick, Lily Collins, Byun Heebong, Shirley Henderson, Daniel Henshall, Yoon Je Moon, Choi Wooshik. Okja stomps onto Netflix on June 28th. But will you be tuning in?